Wendy was filled with grief as she saw Peter sink into the Abyss – the dark sea north of Neverland, where no man has escaped before. Beside her was the Indian, Tiger Lily who shared her sorrow. Peter had asked the help of the Indian girl when he learned that an unheard nemesis, Demitrios, had captured Wendy. Witnessing the tragedy, only then did Tiger Lily make sense of Tinkerbell’s words – that Demitrios was the son of Capt. James Hook, that he had fed the pirate Starkey to the crocodile in order to kill it and get the clock from its innards; proving to the crew that his father was incapable of being captain. And that he was responsible for Smee’s death which made the pirates doubt their leader, putting blame on his father and sending him to the plank. This was how Demitrios made himself captain of the Jolly Roger. Tiger Lily, knowing Tinkerbell’s jealousy over Wendy, wept in guilt for overlooking the claims of the pesky pixie. She now understands how Demitrios had tricked Tinkerbell, just as Capt. Hook had done before, to answer some questions in exchange of a promise to kill Wendy. Tinkerbell revealed that Peter flew because of the happy thoughts that filled his heart along with her pixie dust. “He had planned everything.” Tiger Lily whispered as she turned her back from the cliff..
Wendy’s eyes were blank, emotionless as she looked on to the waters. The plain expression on her face revealed a confused and shattered heart. She had been trying to convince Peter to come back home with her to grow up like a normal kid – go to school, get a job, grow old and have kids. Peter had always been angry about it; not this morning. Waking up, he told Wendy that he had made up his mind and he was certain he wanted to be with her forever. He sealed it with a kiss. And now he is lost. In the end, it was Wendy whom Demitrios would use as bait. The pirates captured her by using Tinkerbell to lure her ashore where they waited. Wendy fell for it. To free Tinkerbell from blame, the pirates made it look like a kidnap, attacking Tinkerbell the same. Little did the fairy know she was actually being kidnapped as well. The pirates covered the faces of their victims and tied their hands, only taking their blindfolds once they had reached the murky waters of the Abyss. When finally Pan revealed himself, Demitrios remorselessly killed Tinkerbell. That brought Peter to a rage instantly taking his ability to fly. Demitrios, who was master of whip, sword and pistol suddenly had the upper hand. Peter would only regain himself after the Indians, led by Tiger Lily, attacked the Jolly Roger; successfully rescuing Wendy and taking her to shore where they ran atop a cliff to see what had happened to Peter. But what measly looked like a triumph soon turned to defeat. It would come to their dismay that Demitrios, hanging by the plank at Peter’s mercy, would be able to use his whip on the sail and manage to trap Pan onto the anchor chains, easily reaching the lever that eventually sent it down. Tiger Lily and Wendy could only watch as they saw Peter plunge into the water. 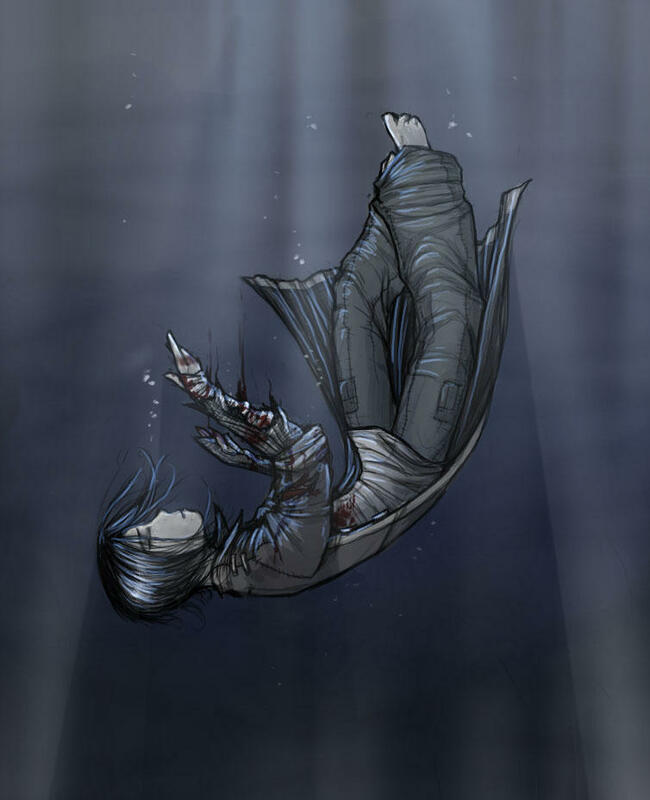 He tried hard to escape from the chains as he battled to stay afloat; fighting for every gasp of air ’til, slowly, the waters of death gripped his whole body. Tiger Lily cried for only the third time in her life. She knew she had seen the last of Peter Pan. She would soon gather enough of herself to turn back to the waters and vow the vengeance of his friend against the cunning Demitrios. It was then that Tiger Lily realized, looking down the cliff, that she had seen the last of Wendy as well. This entry was posted in Literature, Philosophy and tagged Fairy Tales, Myth, Peter Pan by Jack Ross Aethen. Bookmark the permalink. I love the art. Did you draw it? I so enjoy your stories. I like how you take your reader out of the comfort zone with this one. thanks. i guess i just wanted to tell something odd.. i’m glad you liked it. your layout rocks btw. as for the drawing, i didnt draw it. saw it in deviant art. i put the source on the end notes. this is not over right? @raine. i know what you mean. i really wanted to make feel how smart and vicious Demitrios’ character was, but too much detail would’ve made it too long. Okay, I’m sorry this has nothing to do with the entry (I’d come back later! I promise! I just have to point this one out. LOL), I didn’t know you added me in the links. Anyway, please don’t name it Misteryosa because people might mistake me as Shari, the owner of Misteryosa.com. Please name it Yna. Thank you very much! Gawa mo lang? Hahaha. Sequel ba to? Hehe. @jae – no, i deliberately used demitrios name coz he’s exactly the same evil person. @bino/geno – sequel? titignan ko pa.
I’m a fan of Peter Pan. I’m not a fan of Peter Fan but this is good. And gloomy. Hehe! Collina, mia carissima amica. In mezzo alla natura, in compagnia di ottimo cibo, della campagna toscana e di un clima amico. Ti ricordi il Gianluca deciso e dritto che, anche sboailandg, ci mette il suo coraggio e dice quel che pensa a costo di non piacere a tutti? Lo stiamo andando a prendere.